Due to the discovery of footprints in northern Tanzania, researchers have determined that the earliest hominin species was polygynous, meaning that a single male reproduced with many females of its group. The footprints found in Laetoli show that a single Australopithecus afarensis male was accompanied by several females or youths. Similar fossil samples were found in the 1970s, and alongside these new findings, they constitute the few footprints left behind by human ancestors, seeing that they were produced on a cemented ash layer produced by a volcanic eruption. Human footprints found in Tanzania. Image credit: Raffaello Pellizzon. 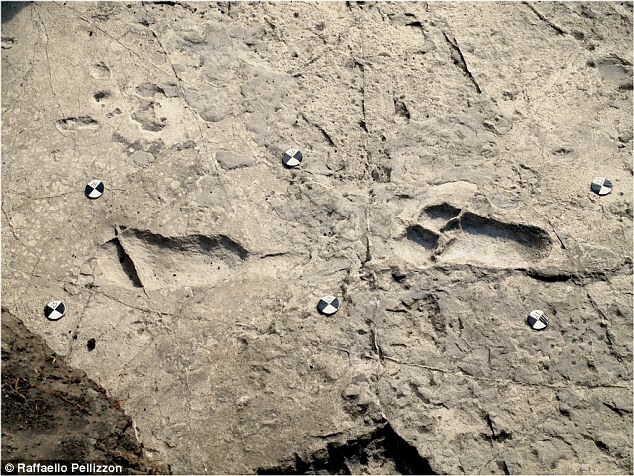 The research was conducted by scientists from Italy and Tanzania led by Fidelis Masao, who analyzed the footprints that date back 3.66 million years. The footprints showed sexual dimorphism, revealing the size and mass of the A. afarensis that lived in northern Tanzania. The male is believed to be around 5.6 feet tall, while the females stood at 4.10 feet. The theory is that the species was traveling in a group most likely comprised of one large male, two or three females, and one or two youths. The remains of the specimen named Lucy were found in Ethiopia back in 1974. She was named so during the celebration of finding a fairly complete hominid skeleton, where Lucy in the Sky With Diamonds was being played in the background. Researchers knew that Lucy walked upright due to several bone traits. One example would be a formation on its femur that lets the specimen balance itself on a single leg while walking. The skeletal disposition is also suited for supporting weight on two legs, rather than four. Also, her big toe was much more developed than other species’, meaning that Lucy had to maneuver her stance using only her feet. Unlike fossilized bones and teeth, footprints are rare but provide a great deal of information about how a species lived and moved throughout the land. Footprints become impressed on the ground and can be preserved for thousands of years intact under the right conditions. The footprints were found in the Ngorongoro Conservation Area, where similar sets of tracks have been discovered. The remains appear surrounded by other footprints of mammals, birds, and even rain. One theory is that the nearby animals and A. afarensis were fleeing the scene after an eruption of the nearby Sadiman volcano, although other researchers claim that the Sadiman volcano was not the source of the first footprints discovered in 1976. The male specimen analyzed through its footprints also became the largest Australopithecus afarensis specimen identified so far. Laetoli has proven to be an exceptional site for archaeological discoveries, where researchers have found the remains of hyenas, gazelles, rhinos, buffaloes, elephants, birds, and baboons. Curiously, no human artifacts have been discovered in the Laetoli Beds, but in the nearby locations of Ngaloba and Olpiro, there have been some findings corresponding to younger eras of human evolution, suggesting that such region in Tanzania may provide the clues for discovering the links between our ancestors and ourselves as a species. Scientists warn on possible asteroid strike on Earth: Humans not ready!